﻿ Thank you for visiting my website! I hope you found it easy to navigate and welcoming to what you are looking for. I would love for you to contact me so, here are some enquiry forms to make it easy and more efficient . If you don't know or have all of these details, no problem! We will work it out. I look forward to hearing from you and possibly working together! Please include event type, venue and time if you. What services are you looking for and a estimate number of people require our services.What is your preferred method for communicating: email, text, or over the phone? If you don't know or have all of these details, no problem! We will work it out. Uncover your most beautiful and confidence with MakeThisOut and witness a perfect picture of glowing skin, the perfect radiance on your wedding pictures that will last through forever. ​ Fill in the form below now and we will revert to you soonest! Thank you! Your big day is approaching and you deserve to look your best. Fill in the form below and we will revert to you within 48 hours! ​Indulge and pamper yourself with MakeThisOut and be the most beautiful and radiant bride on your special wedding day. 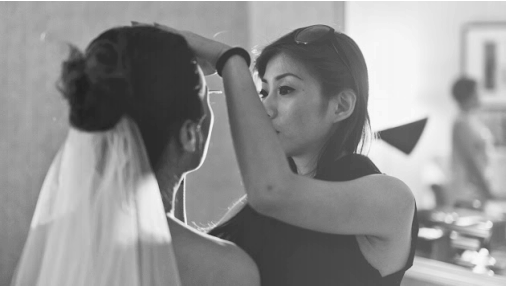 MakeThisOut will help you to take care your wedding entourage ; Mother, Mother in law, Sisters, Cousins, Maid of Honor and Bridesmaids , giving them a well deserved pampering makeover experience. Ensuring everyone will be looking good and feeling good on your very special day. Fill in the form below now and we will revert to you within 48 hours! Thank you! With years of experience in the industry and a rise in demand for her skills, Bernice started MakeThisOut team which is a handpicked team of talented and reliable Hair Stylists and Makeup Artists whom she has worked closely with over the years. Committed in working closely together with our client to achieve their desired looks and to meet their specific requirements. We believe in customizing our services and packages to specially tailor made for the Individual, Event, Designers and Companies, ensuring 100% customer satisfaction and success. Fill in the form below now and we will revert within 48 hours! Thank you. We are more than happy to answer any questions that you may have so please do get in touch and check our blog for all our latest news.